Wire Brush Set, 4 pc. Grizzly T27762 - Wire Brush Set, 4 pc. These handy kits provide an array of brass coated steel wire wheels and tools, all with a 1/4" shank for quick and easy mounting to your drill. These are always great to keep on hand! 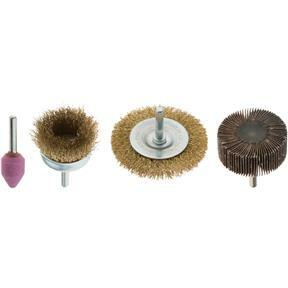 4 piece set includes 1 3" circular brush, 1 2" cup brush, 1 3" 80 grit abrasive flap wheel, and 1 3/4" end brush.